In terms of imagery you will find no more stunning of a hockey book in 2011. Of course with all of hockey history at their disposal, Firefly Books and editor Steve Cameron had a lot to work with. They do not disappoint with a presentation that will leave wowed. 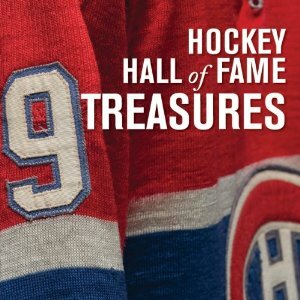 This lavishly illustrated book is absolutely packed with beautiful color photography, displaying the most interesting, unique, famous and rare artifacts from the Hockey Hall of Fame's collection. Hockey history has never looked so beautiful. While the imagery steals the show, the words of Adrienne Clarkson, Dave Bidini, James Duthie and Don Gillmor are mixed in and compliment them nicely. The book retails for around $25, but should come with a warning for those outside of Toronto. As impressive as the photography is, this book will definitely leave you planning every hockey fan's essential trip - a trip to the Hockey Hall of Fame. You might want to prepare to add the costs of flights and hotels to your purchase!